Week number two of April is in the books. So we are updating our Rockport Fishing Report. Here is a little recap of what we have seen the past few days on the Texas flats, and what we expect for the coming week. Spring fishing is here in full force. So this is a much improved Rockport fishing report, over weeks past. So it is finally starting to look like Spring out there… for the most part. The past few days have really turned on, fishing wise. Not that it was bad before really. But the past few days have been pretty darn good out there. Certainly there a few condition changes and reasons behind all this. But it sure has been nice seeing tons of schooling fish all day long these past few days. We’ve been waiting for the fish to get a bit more fired up, and it’s finally happening. As we ended last week, the fishing was still hovering around the “pretty good” range. Then Saturday brought us some pretty gnarly winds, 30-40mph, from the Northwest. The dropped our both our air and water temps pretty dramatically that evening. Where our water had been in the 72 degree range the days prior, we woke up Sunday to air temps in the low 50’s and water temperatures closer to 64 degrees. Not so ideal for this time of year. The winds Sunday morning continued to blow a little bit from the Northwest, but continued to decline throughout the day. By early afternoon, it was pretty much calm on the flats with sun shining and fish in a feeding frenzy. Sunday afternoon and into the evening fished incredibly well. We had singles, pairs, small schools, tails and bank crashers all over the place. It was a great post front party for our redfish. We even made it out into the open water for a couple of jacks, triple tail and even got some futile casts in at a couple of sharks cruising by. With all the North winds, and fairly stout tides, we ended up losing a lot of water between Saturday and hitting the marina Monday morning. We would say that well more than a foot of water had been pushed out by the wind. This actually ended up being a great thing. 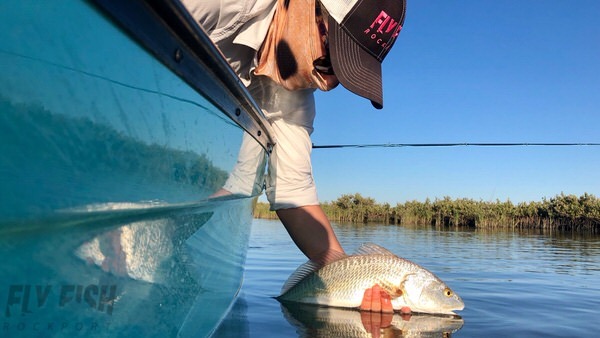 While we have had to deal with some pretty strong winds from the South the past couple of days, the low water has pushed a bunch of our fish together. Both yesterday (Monday) and today were a constant string of schooling reds. Most in the 20-30 fish range, on a rampage up the bank. Tails, backs, crashes and all types of mayhem make them pretty easy to spot at a great distance. Of course we are seeing singles, pairs and other small schools swimming around out there as well. The larger fish have typically been solo or with just a couple other fish. These fish have been really finicky and spooky lately. Not real sure why. But just something we have noticed. But a good cast will still be rewarded. Of course that is kind of the hard part when it’s blowing 20+ out there. But we are seeing some large fish. Even a bull or two in the right spots. Most often, you catch a glimpse of a big fish as you are entering/exiting a flat. They’ve been hovering around the edges of a few areas, in about 3-4 feet of water. So we are keeping our eyes peeled for more of those out there. Also, we are still seeing a pretty decent number of large trout in shallow. Most are spooking, before we know they are there. So it’s tough getting a shot at them. But they are out there. And of course there are always schools of sheepshead and small drum this time of year as well. As it is spring, and things are starting to warm up a little bit, we have been seeing other fish running around. There are a good number of jacks around. We’ve been seeing them while poling around in San Antonio Bay, Mesquite Bay, Carlos, St. Charles, Aransas and Corpus Christi Bays. Usually, these are pretty tough to get a fly to. They move across the flats very quickly, and are usually solo. So by the time you know what it is, it’s gone. But it’s interesting seeing them pushed in that far into some of these bays. Obviously we’ve been seeing plenty of them out in the gulf or open water, as you might expect. But cruising the flats is a little less common. We also started seeing our first couple triple tail on Sunday. While we were out looking for jacks on the surface in the deeper water, there were some fish floating around out there and hiding under a couple channel markers out beyond the jetty. So hopefully we will be able to find a few of these in the coming days as things warm up a bit more. With the heavy Southeast winds both yesterday and today, we are starting to get a good bit of our water back. It didn’t seem to matter today, as the fish were still schooled up all over the place. Hopefully that trend continues. But you can probably expect them to spread back out a bit more as the water creeps back up and begins filling all the lakes and marshes again. It looks like tomorrow is our last big wind day, then things begin to mellow out a bit more on Thursday and go back to normal around here. The weather late this week and into the weekend looks great. Sunny skies, easier winds and air temps right around 80 degrees each day. This will allow our water to warm back up a little bit and keep these fish nice and happy. So things should fish very well through the weekend. Our fly selections have been fairly standard. Although some of these fish have been a bit “selective” we’ll call it? Typically, we blame the fish and not the fly. Then, the next good presentation gets eaten and all is right in the world again. But, there have been a few head scratching moments with some fish not playing nice. So we’ve changed it up a bit here and there. Crab, shrimp and baitfish patterns have all produced fish. The darker crab/toad patterns are still our best. A few more natural colored crab and shrimp offerings have worked as well, when things get weird out there. Or an unweighted reducer in pink has been a good backup plan as well. A topwater at any school of fish will get destroyed. And a size 4-6 swamp thing in sand or pink will pick off some of those schooling sheepshead we are seeing out there as well. And since we’ve gotten a couple messages asking… We are throwing the Squid Vicious or EP style baitfish patterns with the most success at these jacks around. Black/Purple or Chartreuse/White have been our favorite. If they are on the surface, the XL Tube Top in Chartreuse/White or Pink/White have been our best. Don’t forget to beef up your tippet for those jacks. They will break off 20lb like it isn’t even there. Likewise, go lighter at some of those spooky reds these days. 10-12lb is pretty standard for us this time of year. Overall, the fishing has been outstanding since Sunday. We do have a tiny bit of weather tomorrow, but are hoping that it won’t put a stop to anything. If not, then you should expect excellent fishing the remainder of this week and through this Easter weekend. We have boats on the water every day. So we will continue to post some stuff and keep everyone up to speed with what we are seeing out there on our Texas flats. If you are looking to get out on the water, you can always contact us any time if you would like to BOOK A TRIP or need any up to the minute Southwest Texas fly fishing or Rockport fishing report type news. We continue to post on Instagram, Facebook, Twitter and Snapchat. Or perhaps SUBSCRIBE to our YouTube Channel as well. We continually are trying to add more videos and stuff there. We try to keep stuff fresh for those of you that are wishing you were on the flats with us. So be sure to follow us on all our social media stuff. And don’t forget to sign up for our monthly newsletter below.